Why All of this Stuff? Building the 21st Century Grocery Store? A testimonial to easy data visualization and exploration. I believe that data visualization should always be the first step to analytics. Which means it can often be all that is needed. Even if you need to ultimately do something more complex to solve the problem, the initial exploration will allow you to improve and confirm the results. In the Smithsonian Mag: A good nontechnical view of the current state and future of the bionic body. " ... The Insane and Exciting Future of the Bionic Body ... From “i-limbs” to artificial organs, advances in technology have led to an explosion of innovation in the increasingly critical field of prosthetics ... "
Vincent Granville measures the frequency of use of different keywords and finds the use of the word 'statistician' dropping versus 'data analyst'. Death of the statistician? I don't think so, but some re-calibration of the meaning of this and related roles like 'data scientist'. He also explores the use of related terms. It is not uncommon to stream point of view surgery video. Apparently an early case of doing it with Google Glass. Not new, but can lead to thinking about different kinds of viewing augmentation that would be useful to a surgeon. Or interaction with AI assistance? Better robotic augmentation? I recently commented on patent trolls. I have been on the receiving end of being threatened by patent trolls. I was informed that there is now an advertising effort underway to stop the madness, called Stop Bad Patents. Sponsored by companies I have worked with, like FMI and EFF. In the retail space, see FMI's view. And the useful definitions and comments of EFF. Very good piece in the HBR Blog. Emphasizing about how you should set your self up and prepare for client meetings such that your capabilities are not underestimated. Very good advice by Dorie Clark. Read it before your next client interaction. From the Foresight Institute, an upcoming conference in February 2014 , an excellent source of information in nanotech. Their site is well worth following. Particularly interested in how this technology can be modeled and simulated to understand its future capabilities and uses. Using in-store gamification. Via John Curran of 5th Screen Display Services, who worked with us at our Innovation centers and introduced us to advanced interactive displays. How might such displays be used as part of an engaging in-store game? Contacy John for more information. More details will follow here. Took a close look at Pinterest about a year ago. Was interested in a largely non-text way of communicating, especially in a strong story format. I was disappointed in how well it supported sequential strong stories. Still have continued to have a presence there and think about its implications. A ReadWriteWeb post about how it is being used by businesses that is instructive. Google decides to encrypt cloud data. A very good idea to do this in general. Cloud data is a target. In GigaOM: Lawsuits have been issued against Apple and others. The patent mentions systems that can determine and utilize their location. Should could have broad relevance to smartphone, other mobile and related systems. Another indication of how the Patent system is broken. Not too many details, but consumer goods giant is exploring crowdsourcing for future consumer need and product development. Using the online package eYeka. The work is to develop the next generation of showers. " ... This universal daily ritual leaves you feeling relaxed, clean and fresh. Long showers are even more enjoyable, but they have a considerable environmental impact: showering uses a lot of water and requires a lot of energy to heat that water. So how could we enjoy showering while having a minimal impact on the planet and on our wallets? ... "
This progress at the U of Washington implies more. Once you can establish a brain to brain connection, you can also connect a brain to Internet to brain connection. An Internet of brains? Includes a video. The implications? " ... “The Internet was a way to connect computers, and now it can be a way to connect brains,” Stocco said. “We want to take the knowledge of a brain and transmit it directly from brain to brain.” The researchers captured the full demonstration on video recorded in both labs. The following version has been edited for length. This video and high-resolution photos also are available on the research website. ... "
In Fast Company: Not sure this will be generally useful. Would prefer interface and quality improvements to Skype. Though in thinking it through it might be an interesting way to augment 3D remote printing applications.
" .... virtual images can be difficult to retrieve and manipulate. A surgeon can't use a mouse or keyboard, because they are unsterile and pose a risk of infection. A surgeon can give instructions to someone else, who then can operate a mouse or keyboard, but the surgeon must break concentration to say, "Right ... right ... up a little ... OK."
" ... Now, a team at Microsoft Research Cambridge consisting of social scientists, computer scientists, and designers has used the Kinect for Windows hardware and SDK to simplify this process. It enables doctors to use simple hand gestures to change, move, or zoom in on CT scans, MRIs, and other medical images. In initial development, the Kinect for Windows-based system has thrilled surgeons who have seen it and who believe it could help make surgery faster and more accurate. The hope is that these systems will deliver better outcomes to patients when fully field-tested and approved. The project, called Touchless Interaction in Medical Imaging, to bring Kinect for Windows into surgical suites has been guided by Helena Mentis, a Philadelphia native and a postdoctoral researcher with the Socio-Digital Systems group at the Cambridge lab. ... "
In Computing Now: Insightful piece on why cloud computing is linked to innovation. I admit that I started out thinking that the Cloud was simply an obvious tool, but have become more convinced of its importance: " ... The same is true for many other businesses. Cloud computing is enabling the transformation of entire industries by providing companies with the ability to innovate and bring new products and services to market at an unprecedented rate. More than that, however it is changing how IT departments operate on all companies, regardless of their size or the market they are in. ... "
Via the ACM: Digital Game-Based Learning. Abstract: Research published by University of Rochester neuroscientists C. Shawn Green and Daphne Bavelier has grabbed national attention for suggesting that playing "action" video and computer games has the positive effect of enhancing student's visual selective attention. But that finding is just one small part of a more important message that all parents and educators need to hear: Video games are not the enemy, but the best opportunity we have to engage our kids in real learning. Author and additional background. A Challenge: Just because a study contains numbers or big data or statistics does not mean it is correct. So you should not completely trust any scientist for business purpose. Results from science should be carefully applied and validated to decision and business. For that you need to know the business well enough to make the call of its correctness or value. In the HBR Blog Network: An anonymous, large network of commenters can lead to some nasty and self serving behavior. We all read customer reviews with an element of skepticism about their motivation. Always interesting Michael Schrage takes on the problem: " ... Accountability and transparency cut both ways. There's no question that consumers have more power than ever before to call attention to bad products, services, and experiences. But it's equally true that companies also have greater power to call attention to bad customer behaviors. The same social media platforms that can viralize customer complaints can similarly share unflattering aspects of customer excess. That may be a powerful incentive for better behavior. ... "
" ... A DMP is a centralized data management platform that allows you to create target audiences based on a combination of in-depth first-party and third-party audience data; accurately target campaigns to these audiences across third-party ad networks and exchanges; and measure with accuracy which campaigns performed the best across segments and channels to refine media buys and ad creative over time. Slice and dice your own online and offline first-party data to create audience segments for display, search, video, and social campaigns; apply it to ad campaigns targeting audience across the purchase funnel; and get visibility into the ROI each campaign delivered for each segment. ... Marketers can pull in and analyze all audience data presenting a 360-degree view of how campaigns perform against specific target audiences. ... "
Rumors of a Nokia tablet has got the tech world buzzing, but Nokia’s plans to expand beyond the handset are much more ambitious than producing a mere slate. Nokia EVP of Location and Commerce Michael Halbherr told GigaOM that the Finnish handset maker is eyeballing the car as the next repository of its technology and applications and has plans to launch some form of connected car platform in the future. ... "
A good description of how McDonald's is using mobile augmented reality for corporate sustainability PR and positioning in Europe using games. Via Metaio. " ... The new augmented reality app, "McMission" McDonald's Germany, is a playful approach educate McDonald’s visitors and mobile users on the company's commitment to sustainability. Coinciding with the publishing of McDonald’s third Corporate Responsibility Report, the app is now available on Google Play and the iTunes App Store for download. Through four interactive mini-games, visitors learn about the societal and environmental initiatives in which McDonald's and its franchisees are involved. ... "
In Fast Company: Linea Photosharing. A great idea, simple design, a sort of Facebook without all the other complexity. I also often used images to record and present ideas in business, where what I really needed was a simple and direct way to construct and share a collage of photos. This appears to be such a way. For compliance applications? Please don't make this unnecessarily complex in future updates. An article in Junk Charts talks about hating the defaults in data visualization packages. Well, you should at least consider what the defaults are and be sure they are reasonable for your purpose. Thoughful piece. Design has recently been brought to my close attention. Tim Brown writes about his book in Linkedin: " ... In my book, Change By Design, I chronicle the end of Design with a capital “D” and the rise of “design thinking,” a more collaborative, human-centered approach that can be used to solve a broader range of challenges. Design thinking harnesses the power of teams to work on a wide range of complex problems in health care, education, global poverty, government — you name it. By taking this more expansive view of design, you’re able to have much greater impact. ... "
See also his Ideo blog, which has this and related posts. A good piece by correspondent Bill Franks, whose book on the topic I previously reviewed. It addresses some problems I am addressing in a project design now.
" ... It is challenging to make big data simple to access and easy to analyze. While there are many reasons for this, the one I want to focus on here is that handling big data, given how big data projects are usually implemented today, requires users to learn new tools and technologies. This makes adoption a difficult and lengthy journey. ... We are reaching a crossroads in the world of analytics. Over the years, we have seen analytic environments and data environments begin to merge through the advent of in-database processing within relational database engines. This trend had been leading to a world where analytic professionals don’t have to worry about moving data or accessing different systems to perform analytics. They could simply run their analytic processes against the data where it sits using the tools they know best. Scale could be added to analytic processes even while also simplifying them and using less system resources. ... "
In the Forrester Blog: On alternate points of view, and ultimately adaptive intelligence. Intelligence, must almost by definition, be adaptive to new contexts. Else it soon becomes less than intelligent. When you build such systems you must consider their evolution to maximize application and value. Also a good chart here that defines a number of key issues in the evolution of business intelligence. Google patent that looks at this. Is gaze tracking here the same as eye tracking? " .... As proposed by Google, the system would track the eye movements of users of a Google Glass-like product, specifically a “head mounted gaze tracking device.” The system, in essence would track what you happened to look at while you were using Google Glass. ... " There are many other previous eye tracking patents. Don't know the specific claims here, but many more unlikely patents have been issued. Fix the system. Further convenience for those that use Google for search: " ... From now on, Google's word search results will include synonyms, sample sentences, and some description of the word's etymology. The more detailed results even include a chart demonstrating how commonly the word's been used over time. A small menu also gives you the chance to quickly translate the word into other languages, and you can tap on the microphone on the search bar to hear the results spoken aloud. .. "
Did a quick look at this and it works well. You get the 'detailed' results by clicking on the down arrow in the center of the page. The word usage plot over time is a further interesting feature. As well as a word pronunciation function. The only problem occurs when it is unclear if a word would naturally appear in either a dictionary or a encyclopedia. You get more 'meta' information now if it's naturally a dictionary word. A encyclopedia word drops through to articles from outside services like Wikipedia, which don't have the same information automatically. In the NYT: Work by DARPA like the Darpanet and related activities have been happening for a long time. Part of my graduate education was funded by DOD scholarships. " ... For years, the Pentagon has knocked on Silicon Valley’s door in search of programmers to work on its spying technologies. But these days, it’s the Pentagon that is being scouted for expertise. Entrepreneurs and venture capitalists are finding it valuable to have an insider’s perspective on the national security apparatus when trying to find or prevent computer vulnerabilities or mine large troves of data. ... "
In Techcrunch, A service that allows you to delete yourself from many common online services. There need to be more ways to clean up your online presence. A simple and clever idea, to avoid all the unwanted communications, with some dangers, but of considerable use for the average user. A Bloomberg Video: One of the founders of Roambi talk this strategy. I tried it on the iPhone early on and was impressed what could be done. I like in particular their early look at how they are including a story concept. Having been involved recently in mobile visualization, so plan to take another look at the capabilities. I am a big supporter of local startups and accelerators. Have have been involved directly in three local startups and advised several others. I see that the Uptech Kentucky accelerator has just announced its second round of ideas, to be launched September 9. You can also find out more about their local connections in this Cincinnati.com article. I plan to write more about those examples that match well with my interests. I scanned the list of projects, and found several of interest, in particular: Liquid: Liquid builds mobile software to collect, store, analyze, and organize any and all data. I will write more about these efforts as I learn more. I welcome any of the startups to call and discuss. Letting Data be Your Compass: by Rob F. Walker. Nicely thought out piece on data, decisions and predictive models. Using the word prediction brings your models directly into the decision making process. I always emphasize this in engagements. I like in particular how he says prediction is not stand-alone, but relates to a conversation: " ... What is required is a next-best action, real-time decision making that inserts itself in the conversation every single time something changes: when the customer is acting, reacting, or getting upset. Any such change should cause a re-evaluation of the state of the conversation, and possibly a change of tack ... "
I use the notion of establishing a story line to a decision interaction, and mapping it out that way in early interviews. Stories modified then modify decisions using data. Nice to see this happening. Especially taking this beyond the now dated approach of QR Codes. Note the mention of Blippar technology. Which they say is: " .... a revolution for traditional print and marketing offering the power to turn every single piece of print or physical branding in the real world into an instantaneous digital, interactive experience. ... "
" ... Procter & Gamble's CoverGirl is experimenting with several different ways to leverage mobile to activate its print advertising in magazine, including QR codes, augmented reality and shoppable ads. In Allure’s September issue, CoverGirl included a QR code on a tearaway that leads to a listing of CoverGirl offers, and in the tablet version, CoverGirl integrated a shopping feature into its ads. In Vogue, on the other hand, CoverGirl used a complex augmented reality feature via Blippar technology. ... "
In CIO Today: " ... The MakerBot Digitizer consists of a turntable with two lasers and a camera that can scan objects up to 8 inches in size. MakerBot says its Digitizer can capture details as small as 0.5mm and that its dimensional accuracy is within 2mm. Scans take about 12 minutes to produce. MakerBot CEO Bre Pettis has called the $1,400 Digitizer a "game changer." ... "
In IBM Research News: We used a number of game approaches to teach AI. But business decisions are much harder than games. So games are pointers to AI, but rarely directly applicable.
" ... Dr. Gerald Tesauro, the IBM Research scientist who taught Watson how to make wagers when its Jeopardy!, has been named an Association for the Advancement of Artificial Intelligence (AAAI) Fellow. His development of TD-Gammon, “a self-teaching neural network that learned to play backgammon at human world championship level,” and work applying machine learning across disciplines from computer virus recognition to computer chess, and other fields made him an ideal candidate for the association’s title. You’ve worked on machines that play Jeopardy!, chess and backgammon. What is the significance of machines that can play games? In the early decades of AI, algorithms were not ready to tackle the ambiguous, ill-defined nature of real-world problems. Researchers therefore proposed that complex board games like chess and backgammon could serve as an ideal testing ground for AI algorithms (the so-called "Drosophila of AI"). Tasks such as playing grandmaster-level chess may be incredibly complex, but they can be precisely specified for the computer. By working in these domains, researchers made enormous progress in search, learning, and simulation techniques, to the point where the best computers now surpass the best humans in virtually all classic board games. As a result, AI is now moving on to tackle real-world ambiguity head-on. ... "
We looked at this very early on, but really want to see it work effectively. I think there is also value for the added dimension of data from social games ... " ... Mobile games are touted as a prime platform for marketers ... Games are a good complement to social networks on mobile devices and a prime opportunity for marketers, industries executives say. With $12 billion in mobile gaming revenue projected for next year, "mobile gaming has become a big deal very quickly. It took the video games business 10 years or more to get to that kind of size," said Facebook games lead Simon Whitcombe ... "
In SlashGear: Another indication of advances supporting remote manufacture. " ... What the team at Microsoft is doing this week is going through how users of the next-generation update of Windows 8 will be able to work with 3D printing from the core of the software. This sort of update means that Microsoft – one of the most influential technology companies in the world – has confidence enough in the future of the 3D printing universe that they’re willing to dedicate real time to it for the common user. ... "
In GigaOM: " ... Thanks to the growth of 3D printing, intelligent robots, and open-source hardware, tomorrow’s supply chains will be faster, smaller, cheaper, and local. ... " . I agree that 3D printing will make strides in the near future. 3D printing technology will also allow us to differentiate items as well, minimizing what we need to ship. Many items will thus be remotely manufactured by transmitting bits rather than entire item.. But we still need large and complex items that are composed of atoms, and get these to the right place. Note my other explorations in this space. I recently reported on the current state of face recognition. The most obvious use of all, why not use it as a pin for security? Too easily mimicked from images? An example in Finland. From a system called Uniqul. We experimented with iris scanning systems. From Mindhacks: by the author of the Neurophilosopy blog, Mo Costandi " ... 50 Human Brain Ideas You Really Need to Know, .... As its title suggests, the book contains 50 short chapters, each devoted to an influential idea about how the brain works, amounting to a short primer on modern neuroscience for the general reader. .... ". Have not read, but on my list. Via MJ Perry: In another of his investigations into the power of markets based on price. Notable here are the large number of parameters for the price: " .... University of Michigan becomes one of the NCAA’s early adopter of dynamic pricing for single-game football tickets, based on team performance, visiting team’s performance, weather forecast, and remaining ticket inventory in specific seating locations. ... "
My son pointed me to design page of Kyle A. Koch: " ... a (former) industrial design student at the University of Cincinnati's College of Design, Architecture, Art and Planning, known as DAAP. This is where I share things about design, technology, creativity, and everything else that catches my eye ... ". In particular see his use of Ponoko, a remote fabrication system that I have read about, but never really experienced. More about Ponoko. See his personal show room for Ponoko products. For example, a device for taking pictures of pages using an IPhone. And a recent ReadWriteWeb article on Ponoko. In Engadget: Note the integration with decision flow. Ford studies space robots to improve communications with connected cars. " ... by studying the way robots interact, Ford hopes to develop its cars' communications systems so that tasks like contacting emergency services after an accident will be performed even if the vehicle is damaged or the data connection is lost. What's most fascinating are the so-called "mesh networks" which allow robots to maintain a flow of information amongst themselves and with their controllers on Earth and aboard the International Space Station in the event of a disrupted connection. ... "
I was reminded today of 5th Screen Digital Display Services. They worked with us in our innovation centers to provide excellent examples of in-store marketing engagement. They have updated their site and blog. More information from them will follow.
" ... We help Brands, Retailers, Restaurants, Hospitality and Corporations meet the digital consumer within their physical space by using amazing technology to create engaging unforgettable experiences while they are shopping, dining, checking in, or waiting. ... "
" .... This uniquely accessible book will help you use predictive analytics to solve real business problems and drive real competitive advantage. If you're new to the discipline, it will give you the strong foundation you need to get accurate, actionable results. If you're already a modeler, programmer, or manager, it will help you master crucial skills you don't yet have. Unlike most books on predictive analytics, this guide illuminates the discipline through practical case studies, realistic vignettes, and intuitive data visualizations–not complex mathematics. Thomas W. Miller, leader of Northwestern University’s pioneering program in predictive analytics, guides you through every step: defining problems, identifying data, crafting and optimizing models, writing effective R code, interpreting results, and more. In Mashable: Interesting comparison of digital and classical approaches. The strong sharing aspect is particularly interesting. " .... Coca-Cola's first all-digital campaign has resulted in 4 million visits to the 40 websites created for the effort, and about half of those views came as a result of visitors sharing media with friends, the company said. Visitors to the "Ahh" campaign's sites stayed for an average of two-plus minutes, a "time spent" factor that exceeds the time teens would pay attention to a television ad. "The objective was engagement. We got teens going from one site to the next once they go in," said Jennifer Healan, Coke's group director of integrated marketing ... "
In Supermarket News: A view of how grocers are using and can use tweet chats. Fairly obvious, but a good review of a retail strategy. Not much here about its use to promote private label, where I think it can provide value. From the BBC: Using tablets as cash machines. Progress in the UK: " The ATM of the future? " ... There are 66,134 cash machines in operation across the UK - an all-time high - yet they have changed little since they first appeared on the High Street in 1967. As payment methods move digital, so cash machines will need to develop from the terminals that we have all become used to, experts say. The main challenge comes from the smartphone. Mobile banking allows customers to check balances, organise transfers, make swift payments between friends in restaurants or pay the local tradesman. The answer from the industry, it appears, is to make the cash machine more like a smartphone. A recent cash machine jamboree in London featured a host of prototype terminals that had the look, and feel, of oversized smartphones or tablet computers. ... "
" .... The Department of Homeland Security tested a crowd-scanning project called the Biometric Optical Surveillance System — or BOSS — last fall after two years of government-financed development. Although the system is not ready for use, researchers say they are making significant advances. That alarms privacy advocates, who say that now is the time for the government to establish oversight rules and limits on how it will someday be used. ... "
The HP Moonshot System is like nothing else that exists today. It’s a huge leap forward in infrastructure design that addresses the speed, scale, and specialization needed for a "New Style of IT." HP Moonshot web servers are designed and tailored for specific workloads to deliver optimum performance. These low power servers share management, power, cooling, networking, and storage. This architecture is key to achieving 8x efficiency at scale*, and enabling 3x faster innovation cycle. .. "
Interesting piece from Bain & Company: Steps to better decisions. The technical and social aspects of the decision process have been a long time interest. We studied how the decision and innovation process intersected. Often it is done poorly and haphazardly. Technology gives us the opportunity to support the decision process, and mobile devices make it available anytime and anywhere.
' ... Decisions are the coin of the realm in business. No company can reach its full potential unless it makes good decisions quickly and consistently and then implements them effectively. Good companies can’t become great. Troubled companies can’t escape mediocrity. Our 10-year research program involving more than 1,000 companies shows a clear correlation (at a minimum 95% confidence level) between decision effectiveness and business performance. And it isn't just financial results that suffer. Organizations that can’t decide and deliver are dispiriting to their employees. From the C-suite to the front line, people feel as if they’re stuck in molasses or trapped inside a depressing Dilbert comic strip. ... "
A few years ago I worked with a group that was building real time communications Apps for firefighters. So this App could be used with police and firefighters to record and communicate video and audio. Alert first responders to dangers and provide information to make them work better together. Save a number of lives. The basic device of Google Glass will have to be designed radically to work in those contexts. Another in a series of Computerworld articles that describes why and how you should take Google+ seriously. Yes I know, another case of dependence on Google. Worth another look. have had to because of a client dependence. Google was down yesterday. About four hours I read somewhere. I track the hits that this blog gets. It uses a Google product Blogspot and is tracked through their analytics package. A rough look at previous Mondays indicate that my hits for that day were down about 25%. Whether this was because of the blog not being available, or hits not being recorded is unclear. The event itself, given how much Google is used, gives you caution about its use. And complete dependence on the Web itself. In MIT's Tech Review. With links to more details. Computing more like we do, the article says. More like is the key. I remember there was much ado about how neural networks of the 80s were mimicking our brains computing. We do not know how the brain really thinks .... we know the workings of some micro aspects of the brain, and can mimic these. We know some of the macro aspects of the brain, and can measure these. But we don't know how very basic and important intermediate aspects, like memory, do work. Good to see the progress. Former colleague Lou Killeffer interviews ... Ken Savin ... Director, Process Chemistry & Special Projects at Eli Lilly & Company and the first At Lilly, Ken has collaborated on a number of cross-functional projects spanning Lilly’s Discovery, Global External Research & Development, Process Chemistry, and Product Development organizations and now serves as technology and innovation advisor to Lilly’s Development Group, centered on product design and development. In Ars Technica: How media influences how science is perceived. In the past it was about how science was influenced by the popular press. Now the ubiquity of links and search and social strongly influence how the public sees science. And how that perception can be manipulated. " ... The 2012 report also challenged the view that individuals were simply using the Web versions of newspapers to get their information about science. Almost half of respondents relied on online sources rather than traditional ones: blogs, social networks, and Internet searches. Data suggests that scientists are also starting to rely on these alternative channels to stay up to date with developments in their fields. In 2010, one in five American neuroscientists reported using blogs to follow news about scientific issues, and one in four physicians used social media at least once daily to stay current on medical information and innovations. ... "
One-third of digital media budgets will be allocated to cross-device campaigns this year, up from 24 percent last year and 19 percent in 2011, according to a new report from ValueClick Media and Greystripe .... "
Study after study shows that employee engagement, an index of bringing one's best and full self to work, is not just an organizational nicety. It is a business imperative, linked to a number of performance outcomes, including profitability, customer satisfaction and turnover. A 2012 report on human capital from McKinsey added to the evidence, noting that organizations with top scores in employee motivation are about 60% more likely to be in the top quartile for overall business health. Companies I work with in my consulting practice who have done their own internal research have found similar linkages. ... "
Next week California legislators are voting on an enhanced drivers license or EDL. More here. Such a license contains a RFID tag that points to a personal identification number. These can easily be read, but apparently only at a short distance. It could make traffic and customs stops more efficient. It could also lead to more general tracking of people and loss of position privacy. I am less concerned than the article is. There are many ways to gather this data already. We can grow to expect this. Mostly we need to understand how government is using and importantly, sharing the data. Remembering also that data mining will make this kind of data more revealing. Smartphone as home control center. Ultimately linking purchasing decisions made room by room to online and in-store behavior? Have been exploring the latest 2014 physical IKEA catalog, with is an already large (320 page plus) slick paper catalog that broadly and artistically explores IKEA's offerings. The catalog is then augmented by using the IKEA App from a smartphone. You view select pages through the camera of a smartphone and you see a floating icon that can be clicked. I found the use of the method not consistently easy, and I can see people frustrated by it. A help section shows the remarkably large number of different kinds of displays. The App also allows you to download the full digital catalog, which is augmented by icons on each digital page. What you then get varies by page. In some cases a web page of additional content, in others a video, in others a sizing method that lets you 'see' what a piece of furniture looks like in the room you are in. Previewing its location through the camera. You can see a different color or style of fabric on a couch. Nicely done, part of the fun is seeing what each value add will be. People are getting used to using methods like QR codes for more content. This tries to link content to local physical states. Thus augmented reality. At first I thought that augmented catalog items needed to be marked by an orange plus sign. But any orange marking on the page is an indication of activation. There are many, That draws you through the catalog pages, if the additions are interesting enough. But since the catalog is already large, it doesn't save much paper. The system has been developed for IKEA by Metaio, more about that here. More in this blog on Augmented Reality. Seth Godin describes the choke point, a clever view of a real challenge: " .... Sooner or later, all big public media companies go in search of a choke point, the place where they can find a leg up in terms of attention and monetization. ... ". Facebook, Linkedin and Google are used as examples.
" ... Simulation-based training creates safe practice environments, where mistakes are learning opportunities rather than potential disasters. A common mantra in health care is “see one, do one, teach one,” implying that once you have seen a doctor or a nurse perform a procedure and performed one yourself, you are qualified to teach the next batch of learners. It’s a clever and memorable saying. Simulation training can help improve on this knowledge transfer process by creating additional opportunities to “see and do” critical skills. ... "
I remain skeptical of the small format, but a Samsung Smart phone/watch is reportedly arriving in September. A reminder. Comments are moderated here. They must be in English. I will not post anonymous comments unless prearranged. I will not allow a comment with links to sites I cannot obviously validate without clicking on them. I do some guest posts, but they must be short and on-point. Some posts here are linked to via my twitter feed at FranzD. Who am I and why all this activity? Blogging in various forms since 2001. I analyze, write and improve. More about me here: http://www.linkedin.com/in/franzdill/ Contact me for more. In Nature: Much about the operational aspects of the brain. The ownership of our own neural data. " ... Unsettling research advances bring neuroethics to the fore. ... " I have been reading Oliver Sack's recent book: Hallucinations, which covers the interrelationship of memory processes and what we commonly call hallucination. Can this be manipulated? " ... The false mouse memories made the ethicists uneasy. By stimulating certain neurons in the hippocampus, Susumu Tonegawa and his colleagues caused mice to recall receiving foot shocks in a setting in which none had occurred1. Tonegawa, a neuroscientist at the Massachusetts Institute of Technology in Cambridge, says that he has no plans to ever implant false memories into humans — the study, published last month, was designed just to offer insight into memory formation. .. "
Interesting, but too much 'California' in this article. Submit that there is is still no efficiency here, and cost will prevail. " ... The Good Eggs "farm-to-fridge" business model turns the supermarket model on its head. Instead of having one or several physical locations stocked with a standard, unchanging inventory, the Good Eggs storefront is online, and calls on local farms to deliver only what customers have ordered that day. Good Eggs essentially stocks and empties a grocery store every day, and because its inventory is based entirely on what each customer is ordering, it's a different grocery store every day, too. The company has created an efficient new food system that's elegant in its simplicity. ... "
Have long been interested in the use of Augmented Reality for marketing, both in the store and in mobile. Still early in its use, but it is evolving quickly now. Good article on the topic in CMO. As with every other digital marketing innovation that has come along, marketers looking at AR can be subject to what Silva called the "bright, shiny object syndrome." Speaker after speaker advised that AR can't be an end in itself--that you have to think about the user benefit first. Uzzan described AR as an "enabler" only after you already have an idea. Lisa Murphy, marketing manager at platform provider Metaio, put it this way: "The end consumer doesn't care about technology." In the coming weeks I will be passing along some of the excellent work by correspondent Phil Hendrix. Here is a set of slides on How Big Data is Reshaping Marketing presented at Emory University, July 29, 2013. However, two important theories – which many of you may have heard of – shed new light on how we can better access the reality of how people behave and challenge some of our orthodox approaches. These theories give us direction on how we can get better estimates of future intentions but also suggest that we should move away from just exploring why the individual respondent did what they did, but rather explore more widely how the dynamics of others around them influence what they do. ... "
I was recently introduced to a book: Save the Cat! The Last Book on Screenwriting You'll Ever Need, by Blake Snyder. Which led me to some questions. Have recently been looking at storytelling techniques to facilitate executive decision interviews. Is there a way to convert an acquired story into a screenplay? Looking at a screenplay as a call to action rather than a record of the history of what occurred. Gather stories, record them effectively, convert them into decisive plans. Thoughts? Interest in collaborating? Via Cacm: A data mining conference whose outcomes will be interesting. Have followed and attended the KDD for years. Will seek to report information that emerges: " ... This week, Chicago hosts the 19th ACM SIGKDD Conference on Knowledge Discovery and Data Mining. More than 1,200 researchers and practitioners across academia and industry are converging to discuss, debate, and advance the field of knowledge discovery from data. A blend of theoretical and algorithmic advances alongside very novel applications and in-the-trenches experiences on applying data mining to solve real world problems showcase the diversity of this vibrant community. .... "
Intel® Retail Client Manager Software (Intel RCM) creates valuable consumer experiences and retail sales opportunities. Intel RCM is an intelligent software solution that enables you to deliver digital content to every screen with greater impact. Retailers are able to remotely manage marketing campaigns in real time while launching customized content on the fly to deliver a richer brand experience ... "
In IEEE Computer Now: None of this seems very new. But there is certainly lots of new data to feed the methods. " ... Companies have long been using analytics to make sense of the huge amount of data they collect from customers, marketing campaigns, suppliers, and other sources. Businesses are always looking for ways to improve this process and are now beginning to do so by adding a new component: location-based data. Location analytics adds geographic, demographic, economic, and similar types of information to the financial and other data that companies already collect. ,,,,, "
Some interesting thoughts on specialization and the data required to manage them. How does this apply to other current hype areas, like Hadoop, Big Data or Predictive Analytics? The comments are also instructive. " ... Hitching your wagon to the latest 'it' technology can lead to lucrative pay and compelling job opportunities, but it's not without risk. dBase developer, anyone? ... "
As part of my role in our innovation centers I often had to work with small businesses that had new ideas in retail. These varied in size from very small businesses to very large. We worked with them to define, develop and deliver their new innovations in our simulated retail environments ad demonstrate them to retailers. These innovations were delivered under the umbrella of open innovation. One thing I saw more than and other was the need to adapt to agile environments. In addition companies were often closer to the retail environment than we were, and had to be able to changes as their market changed. Most of what we did was before social technologies were widely available to consumers, but the new realm of the social, mobile and local connections make this form of innovation more agile even more important. John Mason is the GM of IBM's Midmarket Business. Was wondering how Gmail's new tabbed layout, which uses an algorithm to separate primary and promotional email, might affect email advertising? I like the prefabricated categorization. But will this effectively allow me to ignore promotional emails? Adage suggests is won't be a problem for Email advertising, but I still have my doubts. Jason Hauer of The Garage Group sends along an update of their work, which seems to be flourishing. In particular a very impressive list of companies they are working with, including P&G, Kantar, TNS, Cincinnati Children's and Jergens. Have met with their folks and they are impressive. See their services and capabilities. And a slide share on their approaches to Business Model Innovation. They write: " ... We work with teams to crystallize their innovation strategy, uncover insights and convert them, along with trends and cross-industry analogs, to generate ideas. We facilitate turning ideas into holistic business model prototypes that can be piloted and scaled. In addition, we create and lead training programs and modules on the skills and behaviors that ensure innovation can happen sustainably throughout an organization. Across everything we do, we leverage principles and practices from the world’s most innovative companies and successful entrepreneurs -- we combine focus, planning and measurement with relentless customer focus, smart risk taking and experimentation ... "
From MIT: " ... Views you can use? How online ratings affect your judgment ... Study: Positive comments create an illusory snowball effect, while negative responses get cancelled out. ... " . This was also covered well in Paul Gillin's book: Attack of the Customers: Why Critics Assault Brands Online and How To Avoid Becoming a Victim Reviewed here previously. MJ Perry quotes an animated visual that shows the changes in US population age distribution over the years 1900-2060. Shows the movement of the baby boom bulge over that time and other dynamics. I don't usually think that animated data visualization is directly useful, but here is a good example where it is. I note that the animation is from the finance and economics site: Calculated Risk. Crowd and herding dynamics were always an interest. With the thought of using them for physical retail understanding. Investing is different, but this post has perhaps some related insights. Perhaps for crowdsourcing behavior? Sands Research is giving a webinar tomorrow at 2 PM EST that I just learned about. More about that here. An example of what companies are trying to do today using neuromarketing methods in-store. Will try to attend. " ... The Pre-Store and In-Store Brain: Similarities and Differences You Can Leverage Across Points on the Path to Purchase ... "
Metaio reports that Audi has released an augmented reality enabled manual, linked to a smartphone App.
" ... Metaio, world leader in augmented reality (AR) software and solutions and AUDI AG - global leader in luxury vehicles, today announced the release of the Audi A3 eKurzinfo augmented reality mobile application, available for free download on iOS devices. After the success of the Audi eKurzinfo app for the Audi A1, which was nominated for the 2013 GSMA Global Mobile Awards for Best Mobile Solution for the Automotive Industry, Audi AG has extended the availability to the new Audi A3. 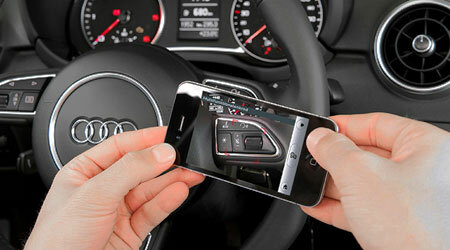 The new app can recognize over 300 individual elements of the Audi A3 – from the insignia on the windshield wipers and entertainment system to actual engine components under the hood – in order to return relevant how-to information or even virtual overlays of maintenance instructions animated in real-time 3-D. Metaio’s cloud-based architecture pushes digital information directly to the device, meaning the user will never have to update the app ... "
Yet another example of nonconscious reactions. Body language. Well known, but not well codified. It has become common in recent years to use other measures like eye tracking, facial analysis neuroscience based methods. Here is a new dimension to consider. A good view of Big Data and Analytics algorithms in the CSM. I like this article because it includes a number of real life application of analytics, several I had not heard of. It does incorrectly imply that all this is new. Analytics have been use for many years before data became 'big'. Algorithms are simply applicable rules derived from analytical methods. These methods use many forms of available data. Former colleague José Ignacio Sordo Galarza has a new site: The Uncomfortable CEO. And I have just finished his new book: The Uncomfortable CEO: Making Information Technology Overcome Business Uncertainty. An unusual book, based on his years of executive experience at Procter & Gamble, during roughly the same time I was there. So I can vouch for some of the experiences and related ideas. In particular this book looks at the interaction between business and technology management. So what exactly is an uncomfortable CEO? It s one that has strong curiosity, the ability to face reality, drives for results and never settles. Strong words. Especially in a time of uncertainty. The book deals not so with the nature of the CEO, but how the CEO works with the CIO, and other management that deals with information technologies. I think it is clear now that information technologies are now strategic, so making this interaction work is key. I particularly liked the chapter called "Resilience in an Uncertain Marketplace". We do live under many dimensions of uncertainty, and the role of the CIO is reduce that uncertainty in the realm of techology. And today it is not just the internal uncertainty, but also the uncertainty of how the consumer is using technologies. What a challenge! In particular, we do live in a VUCA world ... a Volatile, Uncertain, Challenging and Ambiguous world, the CEO, uncomfortable as they are, must ally themselves with the CIO to address many kinds of risk, which are enumerated in the book. Which then includes a statement of what this kind of resilience looks like, and is followed by a case study. Nicely done. The final chapters describes how to bring it all together, with a good check list of issues to be considered. A good book to use in a training or collaboration session with your executives or with a board. Have not tried this in my recent R exploration, but looks to be very useful. Be aware this is fairly technical. I have a recycling bin. It sits out at the curb once a week. When I saw this piece that was what I was thinking of. My bin tracking my recycling. Very different here. A piece of urban infrastructure to follow you via your cellphone. London was an early implementer of camera monitoring, so perhaps not surprising. Update: The system test has been stopped due to privacy concerns. Much agree. Simplicity of development, and then simplicity of understanding through interaction are key elements. Tableau is good at this, but could also be better. I suggest taking a look at some of their examples. Paul Lilford of Tableau talks about data source integration, a key issue: " ... With visualization, there is an “ongoing challenge with the size of data and disparity of it,” according to Lilford. From a customer challenge perspective, “it’s really about getting to the size of data, all the sources of data, all the scale of things.” With Tableau being a data-driven company, the strategy is to combine all data sources quickly, helping customers make more data decisions at a detailed level. Social, web, third party, ERP — all these data sources have to lead to “something that’s consumable for business users.” ... "
In Forbes: An interview with Silent Circle co-founder Phil Zimmermann. Had not heard of the company. The company deleted its secure email service this past Friday. Are there other options for encrypted email that can prevent external entities, like the government, from demanding and getting their disclosure? From their site: " ... we have reconsidered this position. We've been thinking about this for some time, whether it was a good idea at all. Yesterday, another secure email provider, Lavabit, shut down their system less they "be complicit in crimes against the American people." We see the writing on the wall, and we have decided that it is best for us to shut down Silent Mail. We have not received subpoenas, warrants, security letters, or anything else by any government, and this is why we are acting now. ... "
Hackaday is an interesting site to follow. New uses of information technology hardware and software. Which naturally cobble together many well known techniques and unconventional ideas. In this case, pressure sensors in socks gather information about movement. In the Future of the CIO Series: Some very good thoughts here. I particular: Simplicity. Not to say that I follow that recommendation well. As a follower of emergent tech I have a tendency to complicate approaches. But when I find something emergent that includes simplicity, I do embrace it. What ants know. And what complex networks of things can be made to 'know'. Known as Agent Based Models. We studies this a decade ago in the enterprise. Though fascinating, it never did produce big value, say beyond standard industrial simulation. Though a local startup uses it successfully for promotion allocation models. And this does not sound like new news. Anyone have more recent examples? A detailed look. With a number of recent examples, such as Microsoft. Starting to see it everywhere. " ... As the name indicates, flat design is defined by flatness of style: simplifying an interface by removing extra elements such as shadows, bevels, textures and gradients that create a 3D look. ... The idea is to create a finished design that lives in only two dimensions, without losing any of the functionality that a “regular” interface provides. This creates a new challenge for the designer, because by stripping an interface of its decorations and effects, it becomes harder to define the main actions and elements in a design. ... "
" ... the goal of the physical internet initiative is to improve logistics performance in terms costs and service. It believes this can be done by improving "horizontal" collaboration - that is, collaboration across players in the same echelon of the supply chain - perhaps competitors - by in part sharing logistics/transportation resources. At the same time, such an approach can also go a long way to meeting the Global Logistics Sustainability Grand Challenge, the title of an academic article in 2011 that also talks about the physical internet. Now, the potential for logistics collaboration is nothing new. The concept and potential benefits have been well understood for years. Anecdotally, the level of such collaboration has recently seemed to have increased, driven primarily by Green imperatives. But, there are barriers, and the practice is still minimal. What this research is trying to do is to better quantify a wide ranges of benefits from such collaboration, and then take the idea even further by some fairly radical concepts around how to better modularize and integrate the supply chain ... "
I used the Prezi presentation and storytelling tool for a project some years ago. Just revisited it. An introductory video. With many useful examples. It now also has an iPad version that I plan to examine. Does the zooming interface enhance storytelling, learning and boring static marches through bullet points? Useful R Resources. Books, online, lists, videos, examples. Will add this to my list. I find R similar to Mathematica and APL (from long ago). First language I have attempted to become adept in for a long time. I had cause to download Bunchball's whitepaper on gamification (registration required). Logically done, as a non technical review of the underlying idea of using game dynamics in business. Previously here on Bunchball, including Rajat Paharia's recent book on its relationship to the idea of loyalty. " ... Gamification uses proven techniques from game design to satisfy your customers and engage them with your content, community or brand, while simultaneously driving meaningful value for your business ... "
" ... Small and mid-size businesses (SMB) are some of the fastest adopters of IT, as they clearly see the immediate benefits in growing their business and becoming more efficient. IT solutions providers recognise the opportunity in the market to accommodate SMBs in a big way among customers. Today the world is experiencing another sweeping change—powered by big data analytics, mobile, social and cloud. These foundational technology shifts are inspiring forward-thinking leaders from smaller businesses to drive change in how decisions are made, redesign how their teams work, and reassess how to serve the individual consumer. ... "
He goes on to say that big data and analytical techniques are now available to Small and Medium sized Businesses (SMB). Yes, this is revolutionary. The Cloud allows the use of these technologies for any sized business. Adding a strong flexibility capability. In the past SMB's could not spend what was needed to buy the servers, license the software, and deliver the results to its people. Now they can also pay for only what they need. The maintenance and security can be outsourced. All of these capabilities are there, at a bargain. A good example: In a recent project we were asked to deliver analytical methods to tablet based systems. The Small business was not ready to license multiple seats for visualzation software, or the analyical packages needed to test their efficiency ideas. But the use of R, a free open source system that readily links to databases, Big Data and other platforms, could be readily be used to test out ideas, and then migrate these ideas to their core systems. He goes on to discuss the key element of efficiency and some good examples: " ... the use of cloud technologies is enhancing efficiency manifold as it enables the placing of marketing assets such as digital files of campaigns, videos in the cloud so that all involved parties can create, modify, use and share as needed. Marketing data on the cloud makes it easier for marketing staff to access information anytime and anywhere on the field. ... "
" ... The major contribution cloud makes to the SMBs ecosystem is big data analytics. Like larger enterprises, SMBs stand to gain from understanding the importance of big data. Big data can arm small businesses with insights and capabilities by analysing data surrounding their business, creating new ways to operate more efficiently, find new customers and more importantly improve bottom-line results. ... "
Cursory look at the implications for security of Bring Your Own Device (BYOD) implementations. We were early experimenters with the BYOD concept, and security was an immediate concern. In Google Operating System: An indication that Google is now showcasing long form articles. We have become very used to small sized nuggets of information on the web, but we do also appreciate longer, full explanation examples. That is part of the reason I would sometimes go directly to the Wikipedia. The WP article often, but not always, would appear at the top of a search. Is this a way of stealing away attention from Wikipedia as a primary knowledge source? The post contains a number of good examples from searches. Motivation further discussed. Fascinating piece in Wired about the use of game dynamics to map connections in the brain. Another example of the use of game dynamics, one of several that are aimed at gathering scientific data.
" ... Called EyeWire, the browser-based game asks players to map the connections between retinal neurons by coloring in 3-D slices of the brain. Much like any other game out there, being good at EyeWire earns you points, but the difference is that the data you produce during gameplay doesn’t just get you on a leader board—it’s actually used by scientists to build a better picture of the human brain. There’s a huge bottleneck in the lab’s research around image analysis. Created by neuroscientist Sebastian Seung’s lab at MIT, EyeWire basically gamifies the professional research Seung and his collaborators do on a daily basis. Seung is studying the connectome, the hyper-complex tangle of connections among neurons in the brain. ... "
In Wired: Regarding an interesting book on the theory of color, by Josef Albers, is presented on an iPad App. Not free it seems. I recall this book being mentioned in a reference for online color use. I am wondering how well the colors involved can be reproduced in the iPad. 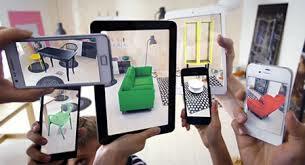 See furniture in your own apartment using augmented reality in IKEA's 2014 catalog. A good example of AR in mobile retail. And its potential for using AR to insert the virtual to measure the physical. " ... To take advantage of IKEA‘s augmented reality catalog, customers download a program through the Apple App Store or Google Play. The catalog is placed within the room the user wants to decorate, and the application senses and measures the booklet itself to create accurate images. Products then appear on your smartphone’s screen in the correct size and color. IKEA hopes their catalog will help to cut down in accidental purchases, or what they refer to as “square peg, round hole syndrome”. They estimate that seventy percent of people do not know the area of their homes, and fourteen percent have admitted to buying items that were the wrong dimensions for their rooms.... "